Takii and the Van Gogh Museum are renewing their current partnership agreement for three years. This renewal is due to the successful collaboration over the past three years. 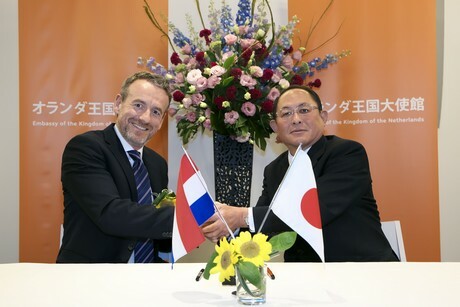 Axel Rüger, Director of the Van Gogh Museum, and Denichi Takii, President and CEO, sign the sponsorship agreement at the Dutch embassy in Tokyo. Its unique collaboration with the Van Gogh Museum has benefited Takii greatly as regards its ‘Sunrich – Van Gogh’s Favourite’ concept. The story of Vincent van Gogh increases the commercial value of the total concept, improving sales as a result. Creating social value also continues to be of great importance for the Japanese breeder of flowers and vegetables.